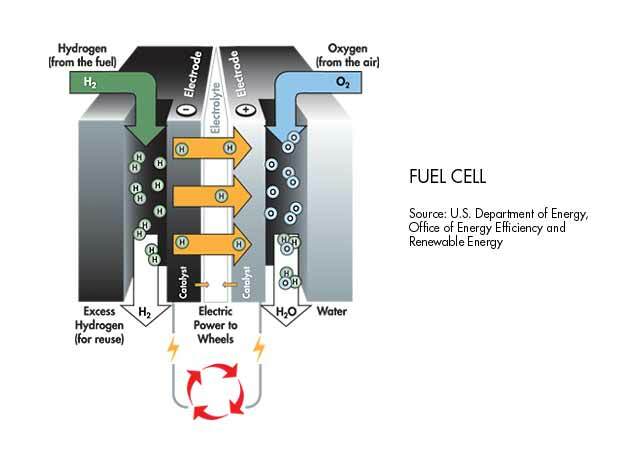 A fuel cell is a compact electrical generator that uses an electrochemical reaction to produce electricity. Unlike a battery, a fuel cell never needs recharging. It continues to produce electricity as long as it is supplied by two of earth’s most common elements – oxygen and hydrogen. When hydrogen and oxygen combine, they create water and electricity. 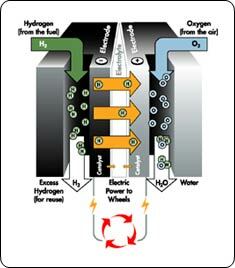 In a fuel cell, the protons from hydrogen pass through a membrane to the other side of the cell. The electrons from the hydrogen can’t pass through the membrane, so they reach the other side of the cell through a circuit, producing electricity. The protons, electrons and oxygen from the air then combine to form water.